My grandmother made a sweet little pinafore that my sisters and I wore when we were babies–each in our own time. 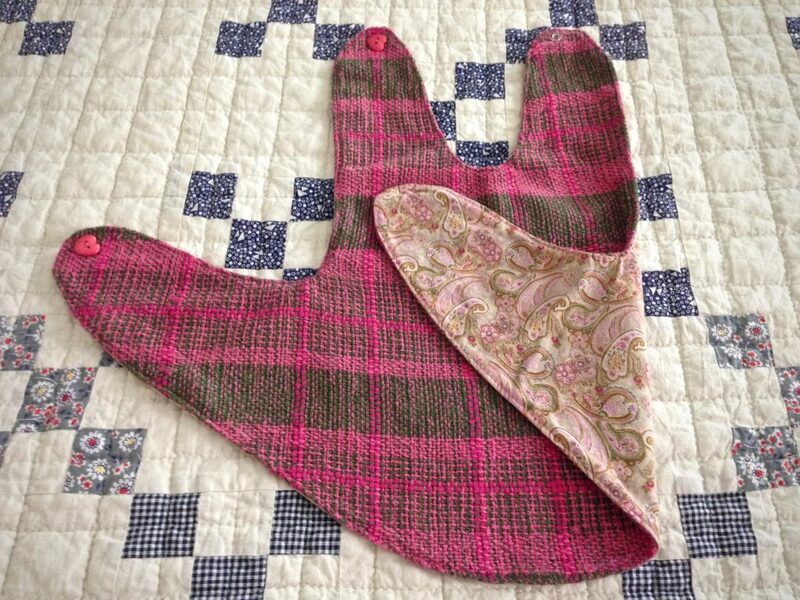 Several years ago I came across that simple little “apron,” and made a pattern from it. My first granddaughter received the little pinafore from me almost six years ago, made from fabric I wove on my rigid heddle loom. Now, this little pink and green pinafore is being handed down to my expectant daughter, for her little baby girl, due this summer. And her baby will have the prettiest handwoven burping towel (or light little blanket) any baby has ever had. Nothing is too good for a grandbaby, right? 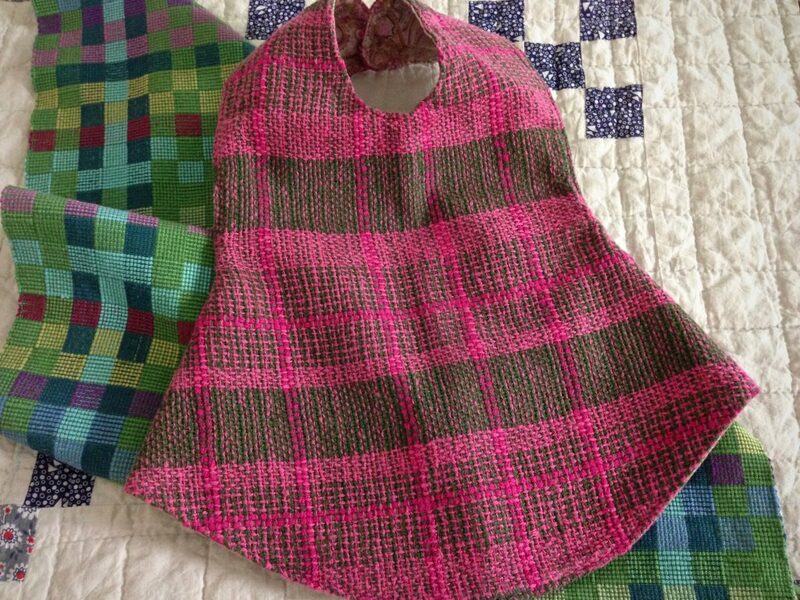 Fabric woven on a rigid heddle loom is used to make a baby girl’s pinafore. The pinafore pattern came from my grandmother’s handiwork. The background quilt shows more of my grandmother’s skill with fabric, needle, and thread. Handwoven towel and pinafore. Fit for a little princess. I want to give something more important than things to my grandchildren. I want to give them the stories of the wonders God has performed in my lifetime. The stories that connect one generation to another. The stories that are woven from ancient stories. Pass down the ancient stories. Weave the threads that the child can wear for life. May your children’s children remember your stories. The pinafore is adorable. Great colors! That burping towel is beautiful. I love everything about it. Can you tell me more about it? These will are wonderful heirlooms for your grandbabies. Laurie, the burping towel is from my recent warp of thick and thin. With this piece, I tried to make it as colorful as possible. It is 100% cotton and will get softer and softer with each washing. I’m glad you like it! Very cute, that would make a great adult apron! Patty, That’s a great idea! Yes, it would be a nice and simple pattern for an apron of any size. Linda, I hear what you are saying. A gift made by your hands is a gift from the heart. It carries with it hours of time, countless amounts of effort, and personal attention. From the giver’s perspective, all these are symbols of love. I like how you put it – consider these things as a hug from grand ma and grand pa. Your children and grandchildren are very blessed to have you! I’m about to attempt a grown up version of something similar soon – as a crossover apron. I have been pondering the design for a while now, have my fabrics selected but need to get on and get drafting. Thanks for the inspiration. Your apron sounds like an interesting project. Glad to be a part of the process! Passing down family stories is so important and you are so fortunate to have creative people in your family. I love the quilt that your grandmother made and it sounds like she enjoyed making things for the special people in her life. Judy, thanks for sharing your warm thoughts! I so enjoy using the quilts my grandmother made. She did enjoy making things for special people, and she also passed on the stories of faith that are so important in our family.